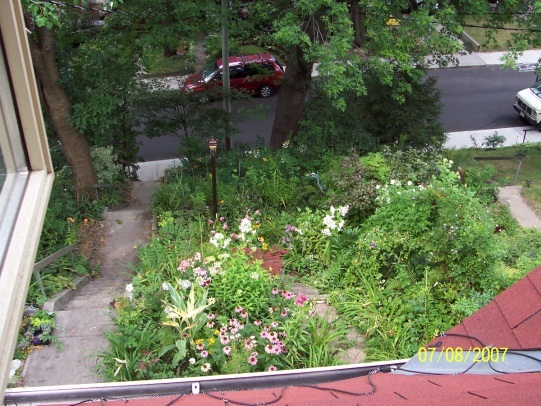 This summer, I moved from a 3 story house up 39 steps from the street. The hill was densely planted. The back yard was small but densely planted. Some of you who visited and relieved me of plants can attest to this. The plant fair helped as well. I am now in a single story (yay!!) 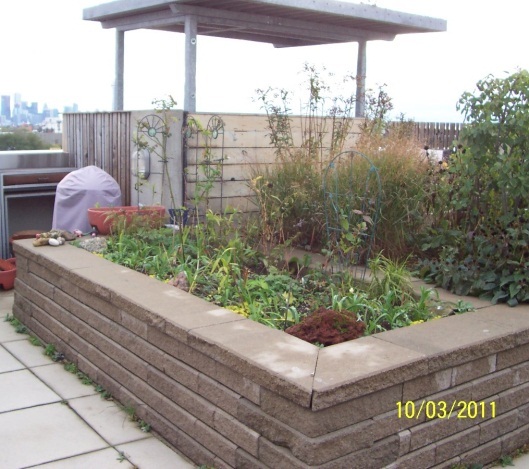 5th floor condo with a west facing balcony and a7th floor east-facing garden allotment (9’x3.5’ stone faced raised bed with a common wall with the next garden). 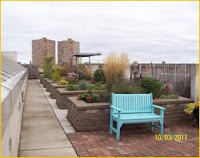 There are many interesting garden features at this new property and I will tell you more about them in subsequent issues; namely, the ground floor exterior and atrium planting, the exterior and atrium balconies, and the roof garden. You may remember this from the plant fair. Quite a lot of it made it there and was very popular. This does well in sun or shade and does not spread rapidly and on the balcony it will be in shade in a sheltered corner for the winter. 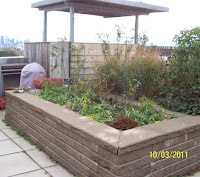 Also, I have a plant stand for overwintered tender perennials and annuals. The roof garden is in full sun which I am not used to and it is very windy. 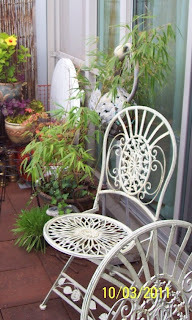 However, “the man in the next garden up-sun of me” has shrubs and tall plants that are a good shield, at least by July. 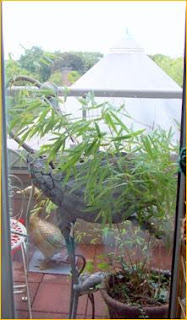 I have brought over a selection of my favourite plants; one short climbing rose(“shades of pink”) on a short trellis (this has to be tied securely since it is a weapon in a gale), some clematis, geraniums, grasses, a dwarf Japanese maple, a dwarf variegated bamboo (double potted so it won’t spread to the next bed!! 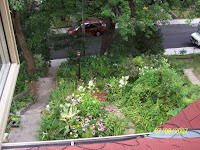 ), daylilies, phlox, coneflowers, bits of groundcover experiments,….. 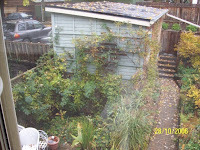 I planted this up in August and as of early October, it is growing splendidly! The violets are reblooming, the cut-off daylilies all have new leaves, and one alpine clematis has big buds which look like they may have time to open. My 5’ high tomatoes survived the move and are still producing and blooming their little heads off.I won’t have a plant-light to start them next spring so will have to use the window. But then, my floor to ceiling, side to side windows let in a lot of light (yay, again). I am told that spring bulbs don’t do well but I am determined to try some dwarf alpine varieties. I have seen lilies growing in other plots so I have moved some of my Martagons here. I have some large pots that I will try (i.e., store) my favourite shade plants in; ferns(I can’t be without ferns), Solomon seal, …. I am approaching all of my plantings (as always) as an experiment. Some of the plants I have moved from my previous garden (most of which I potted up in April in preparation for the move) tend to be for somewhat shadier circumstances, so if they don’t survive I am prepared to try something else. 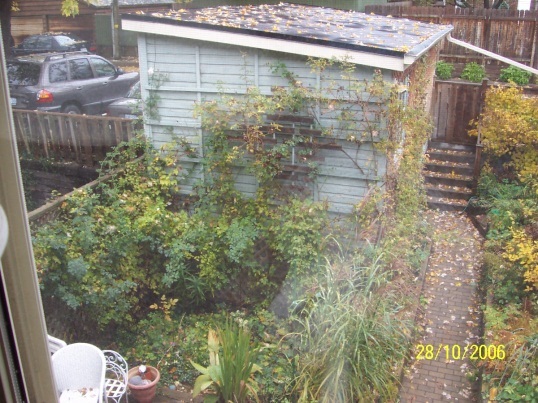 Will I miss my old garden? I don’t think so now that I have all these other gardens to look at. More to come and I will report on growth (survival) in the spring. Your appartment garden is so beautiful. I wonder now you would be growing all the daily required vegetables on your home garden. It will be fun then for sure.